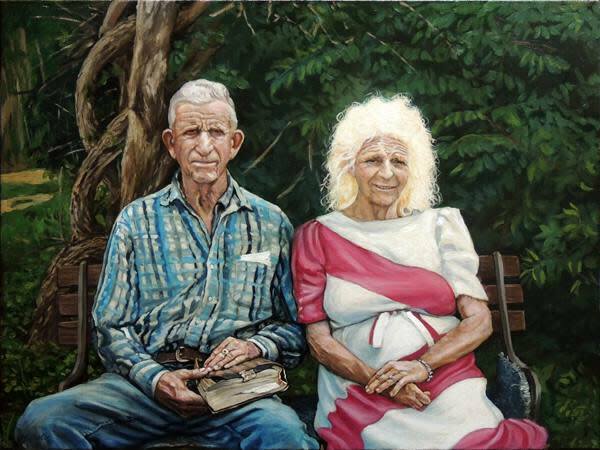 Herb Roe is a generous person both on the canvas and in real life. He happily dedicated over an hour to visit with me during his studio time, and piled my arms with printed products of his work throughout the country. His work is saturated with color, and his process involves multiple layers of research, planning, sketching, and painting. He calls himself a “warehouse denizen,” holed up in a quasi-live-work space in the Warehouse with other visual artists including Chris Pavlik, Robert Dafford, and Brett Chigoy, and audio engineer Chris Stafford. If you haven’t stopped by their hallway gallery space during ArtWalk yet, you’re missing out on an amazing curated snapshot of Lafayette’s vibrant artistic output. 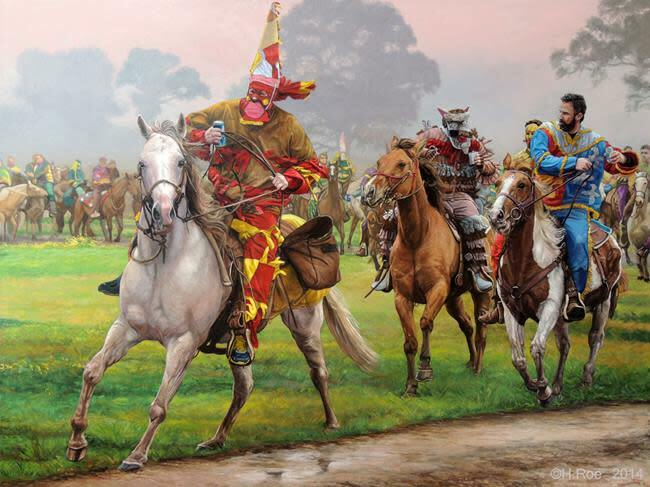 Considering some of his current work on the rural Louisiana Mardi Gras celebration, it makes sense that Herb arrived in Lafayette on Lundi Gras day, 1994, getting off a bus and going straight to a parade. Originally from Ohio, he was in his first semester at a private art school when he met Lafayette muralist Robert Dafford at work on a mural in Portsmouth and joined him on the road, traveling the country and painting murals. He didn’t officially settle in Lafayette until 2001, though, first in what is now his studio and later moving to the outskirts of town. 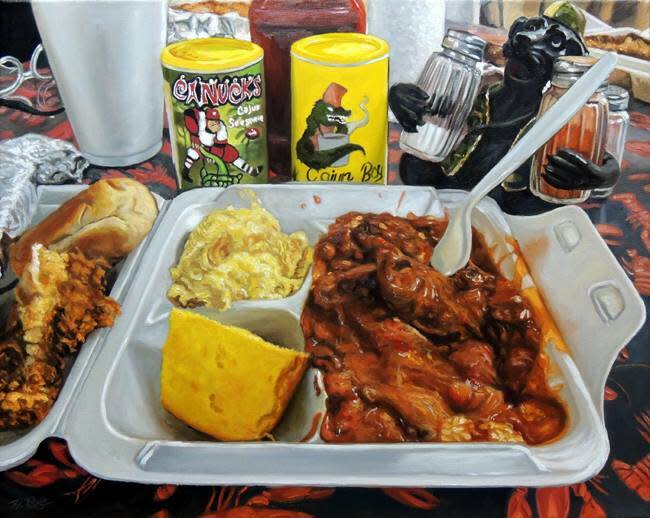 In addition to his courir de Mardi Gras paintings, he’s also taken a deep dive into the local plate lunch culture, returns to Paducah, Kentucky, for several weeks every year to maintain his murals there, and is now working on a series of paintings he calls a “pan-Southern symbolism” that combines his experiences from Appalachia to Acadiana and incorporates the folklore and myth of his upbringing and his chosen home. 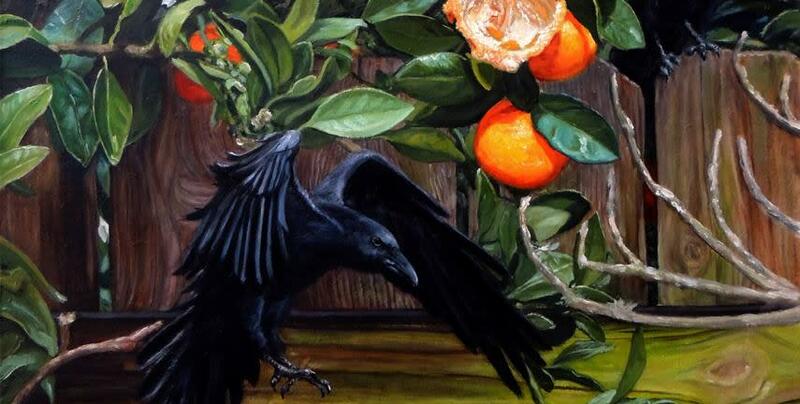 I particularly love his work with satsumas and crows, and if you look closely, you’ll notice wonderful little details that have a rich backstory. The day I visited, he was working on a pond scene, since completed, and he explained to me his method of painting water. But I would be remiss not to mention his fantastic archaeological representations, which he does in part out of his own curiosity and which requires extensive research and planning on his part and which contribute extensively to understanding prehistoric communities, their settlement patterns, and their economic structure. 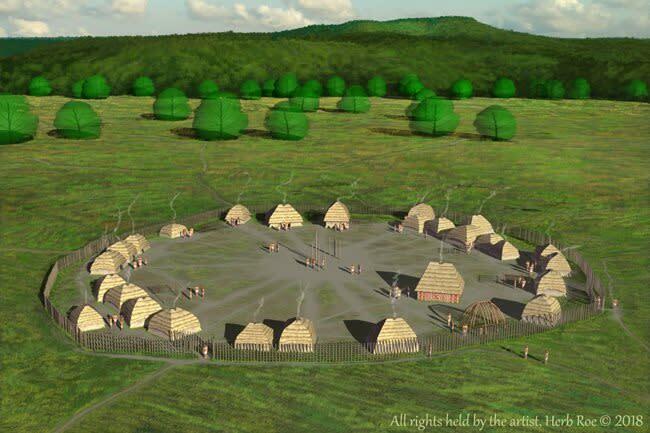 This work appears in major scholarly works and in tourism pamphlets and represents the various Mississippian cultures including the Cahokia of Illinois as well as Louisiana’s own Poverty Point. Herb is inspired by his surroundings, which is somewhat apparent, but his method is informed by Renaissance techniques (some of his early work hangs in his studio and clearly demonstrates this training and experimentation) and now have a decidedly technological advantage through three-dimensional renderings and Photoshop. A single painting can take anywhere from two day days to several weeks, and he enjoys playing with his technique and pushing his comfort zone. Overall, his self-motivation drives his output in impressive levels of productivity and completion. 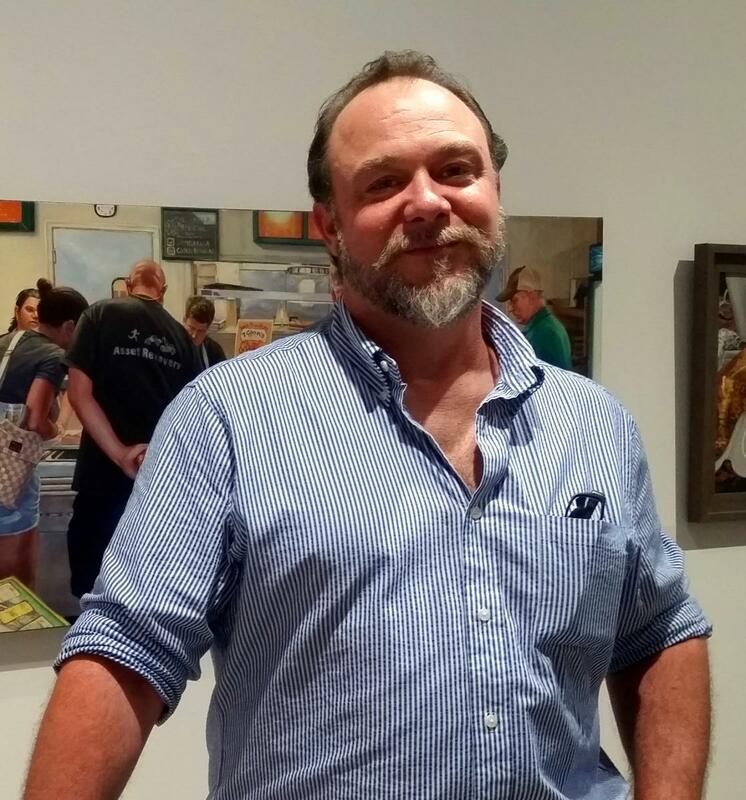 Herb participates in a handful of shows, either solo or collaboratively, each year, and balances that with commission work, mural maintenance and passion projects. I asked Herb to describe a perfect day, and he said it would be a Wednesday. 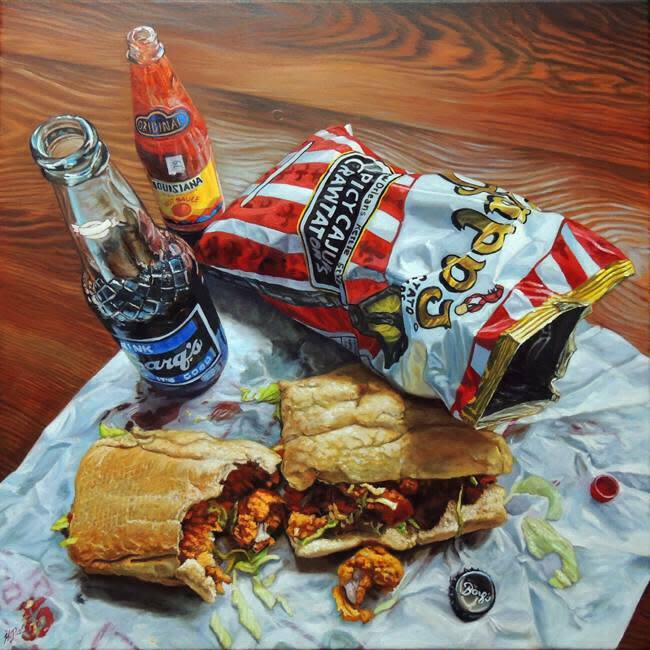 He’d get to the studio early and crank up the coffee pot, break for a walk to Gary’s and a plate lunch, then back go to work in the studio until the Blue Moon Cajun Jam kicks off. If he’s not too distracted, he might stop at the Green Room before the jam and enjoy a Guinness or two. No matter what, it’ll be a successful day, with roughly twelve hours of painting, broken up with good local eats and capped off with socializing with other artists in the Lafayette scene. While his routine and discipline support his livelihood as an artist, he recognizes that we can do more to support the creative community. More local galleries and more locals buying art will ensure Herb and other locals continue to pursue their passion as a career. You can always find Herb Roe on social media by following @herbroe or shopping online at chromesun.com.